Following the announcement of the Committee of the Masters’ recommendation to change the title of “college masters,” the Student Association is soliciting student opinion on the proposal, according to SA President Griffin Thomas. The collection of student feedback came at the request of Rice University President David Leebron, Provost Marie Lynn Miranda and Dean of Undergraduates John Hutchinson, with whom the decision ultimately rests. Hutchinson said they hope to make a decision by the end of the semester. According to a March 29 memorandum addressed to Hutchinson, the Committee has engaged in a sustained discussion on whether to change the title since fall 2015. By a vote of 7-2, with two colleges abstaining, the masters voted to recommend the change. In the memorandum, the masters said discussions originated within the committee and were not prompted by students or administrators. Those in favor of change cited multiple concerns against the current tile, spanning from its irrelevance to the negative historic connotations of the term. Consequently, some also reported feeling embarrassed and having trouble explaining their role to people outside of Rice. Those who opposed changing the title pointed to its positive associations with historic institutions of higher learning as well as other fields. Baker masters Ivo and Rose van der Werff voted against the change. They said Rice has a different history than other universities that have changed the term, who have strong connections with the slave trade. “The term ‘master’ only has a positive history at Rice, it is a term that distinguishes nicely those faculty who are in charge of a residential college from those faculty who hold more academic positions such as the deans of the various schools,” they said. Having spoken to many students, Ivo said he has not talked to any who finds the term insulting or negative. Thomas, a Lovett College senior, said the recommendation should be understood not as an isolated incident but as part of a larger effort to make Rice more accessible. “Students, faculty and administrators have been working to address serious and problematic undercurrents of the university’s culture for some time and this recommendation is part of this trend,” Thomas said. Thomas said problems with the title have come up on both the college and university level. “While it may seem like only a semantic change to some, the term is deeply offensive to many in our community and thus the change has significance to them,” Thomas said. 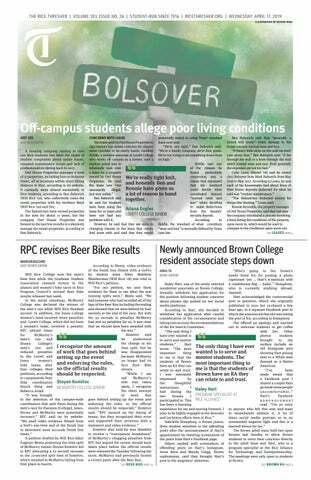 James Carter, a former Orientation Week coordinator and Brown College senior, said he believes the change is overdue. While he doesn’t think his experience is atypical of other Rice students, saying “my masters” to those unfamiliar with Rice elicits strange looks, Carter said. McMurtry College sophomore Paul Onyali, who authored an opinion piece in April questioning the necessity and implications of the proposal, said the announcement has shown him new perspectives. He said while he personally believes the title should not change, if there is overwhelming opposition toward keeping it from students, faculty and masters, then a change should be made to reflect how the community thinks. "I was not fully aware that many of the masters themselves, including those at McMurtry where I'm from, not only felt uncomfortable with the title but also felt like it doesn't accurately depict what they do," Onyali said. "My position on the topic hasn't changed but it was eye-opening to learn that they themselves are behind the proposal, and not just catering to 'PC police' like some people make it out to be. Hutchinson is seeking feedback from faculty. “These discussions provide an opportunity to consider how the college system may continue to provide that high value,” he wrote in an email. The survey could be found on the SA’s Facebook page. It closed on Nov.11.